JAI offers various outgas collectors depends on your application, size and phase from solid sample, liquid sample to gaseous sample. 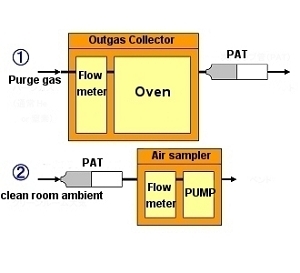 Outgas from electrical parts is trapped and collected at a PAT while the parts are being heated in the chamber at elevated temperature without participation of oxygen, and ultimately the PAT is placed in Curie Point Purge and Trap Sampler to be thermally desorbed into GC/MS. Other brand sample tubes for thermal desorption are also adaptable as an option. Able to customize to meet your sample size and target temperature. Please ask.